Bruce Gladden, Ph.D., Humana-Germany-Sherman Distinguished Professor of Education in the School of Kinesiology in the College of Education, has been named a Fellow of the American Physiological Society, or APS, a nonprofit professional organization devoted to fostering education, scientific research, and dissemination of information in the physiological sciences. It has over 10,500 members. Most members have terminal degrees in physiology and/or medicine or other health professions. 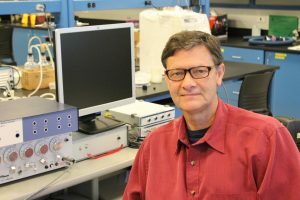 The designation recognizes Gladden for his highly cited research in muscle and blood lactate metabolism and in the kinetics of the oxidative energy system. He has actively participated in national meetings, presented papers, organized symposia and served on committees. He has been a member of APS for 38 years and is currently serving a three-year term as the Chair of the Environmental & Exercise Physiology section of the APS. Gladden has more than 85 publications in peer-reviewed journals and he has an h-index of 40 with over 5,500 citations to his work. After serving as an assistant professor at the University of Louisville from 1978 – 1984, Gladden became an associate professor from 1984 – 1989. He was also the director of the Exercise Physiology Lab at the University of Louisville from 1987 – 1989. Gladden joined Auburn University as a professor in 1989. He is the director of the Muscle Physiology Lab investigating lactate metabolism and bioenergetics from resting to exercise conditions, as well as red blood cell metabolism in different species. In addition to his research, Gladden teaches students at the doctoral, master’s, and undergraduate levels for the School of Kinesiology in the College of Education at Auburn University. Gladden received his bachelor’s and doctoral degrees in Zoology from the University of Tennessee, Knoxville. He also completed a postdoctoral fellowship at the University of Florida, Gainesville. Among his many awards, Gladden received the Citation Award of the American College of Sports Medicine, is a Fellow of the National Academy of Kinesiology, has been named an Auburn University Alumni Professor, an Auburn University Graduate Faculty Lecturer, and has served as Chair of the Auburn University Senate.